STEM programs, research opportunities, and contacts in Mathematics. At Bridge to Enter Advanced Mathematics (BEAM), you'll get to experience an environment unlike any other! NYU- Materials Research Science and Engineering Center (MRSEC) is offering a 10 week REU program. 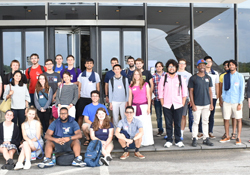 The DOE Scholars Program introduces students and recent college graduates to the U.S. Department of Energy (DOE) mission and operations. Applications for Summer Undergraduate Internships with the Southern California Earthquake Center (SCEC) are now being accepted. You may be interested in these related disciplines! Click on the term to view a list of programs and resources related to that discipline.